The old saying “don’t throw out the baby with the bathwater” warns us not to lose track of what’s important by overemphasizing a negative detail. Anyone who achieves lasting success in the dog game learns that it is the totality of an individual dog that must be considered. While there are specific faults and defects that are deal-killers for any responsible breeder, most need to be evaluated in the larger context of the breed, a breeding program, or the dog’s collection of faults and virtues. However, in recent years a technological advancement has sometimes made the bathwater so murky for some of us that we forget there is a baby in there somewhere. …is another oft-cited truism. This phrase might even be hardwired into the human brain. We are endlessly fascinated by extremes of all types which we often view as ‘better” than the normal run of things. DNA screening tests are proving to be one of those things. Until very recently, the only way we knew to prevent producing something unwanted was to avoid it. If a particular thing was very bad, avoidance might mean eliminating a whole group of related dogs from a breeding program or even an entire breed. Not every one of those dogs would have the potential to produce the unwanted trait, but there was no way to tell who did and who didn’t. The risk of breeding those individuals and possibly producing the bad thing wasn’t worth it despite whatever good traits the dog might possess. Since the completion of the canine genome in 2005, science has been able to pinpoint individual genes responsible for particular traits. When those traits are diseases, a DNA screening test is soon developed and made available to the public. These tests are of tremendous benefit: For the first time in dog breeding history, a breeder can know with absolute certainty what every one of her breeding dogs’ genotype is for various inherited diseases, as well as a few physical traits like coat color. Since dog breeds’ genetic backgrounds differ, the diseases common in one will vary from those common in another. Therefore, each breed has its own set of tests. In Australian Shepherds, we commonly do DNA tests for MDR1, a drug reaction mutation; HSF4, a gene with mutations that cause cataracts, one of which causes most of the cataracts I Aussies; as well as Collie Eye Anomaly and the progressive rod-cone degeneration form of Progressive Retinal Atrophy. About a half dozen other tests are offered for the breed, but the diseases are sufficiently rare that they are used only by those whose lines have those diseases or because a related individual has been diagnosed. All this testing is a good thing: With it we can prevent producing puppies that have those diseases. But sometimes our pursuit of best practices can lead to overkill. In a classic example of more is better, there are people in dogs who decided that mutations ought not to be tolerated at all, even when carrier dogs are healthy. This viewpoint appears to be especially prevalent in Europe, but there are breeders in North America who also subscribe to the philosophy. Anyone who’s been in dogs for any length of time will have encountered someone, usually very new to the game, who proudly declares that she would never, ever breed anything with any sort of fault. Experience soon teaches us, if we didn’t know already, that there are no perfect dogs any more than there are perfect people or anything else. Living beings have flaws. 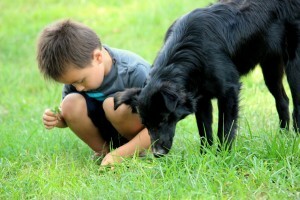 It is the breeder’s task to evaluate those flaws and decide how she will minimize their effect in her breeding program. In most cases this means, among other things, breeding away from any unwanted traits a dog may have. If the dog’s faults are sufficiently numerous or especially bad it may not be bred at all. DNA tests have provided yet another factor for breeders to consider. All of them will tell you what variants of a specific gene a dog has. If it is clear, so is the “bathwater” and nothing need be thrown out. But the presence of a mutation sends some people running to dump not only the water but the baby and the bathtub, too. When DNA test results indicate the presence of one or even two copies of a mutation, the breeder must consider what the presence of that mutation actually means for the dog and her breeding program. Striving for perfection – in this case no mutation – is a lofty goal, but only if eradication of the mutation does not also cause major harm to a breeding program or, worse yet, the breed. This does not mean the breeder can simply shrug off the results and do whatever she wanted to do anyway. She must give serious consideration to test results, but within a wider context than the test result alone. When it comes to health issues, the point is to produce healthy puppies. The removal of affected dogs from the breeding pool has long been and remains an important form of prevention; the affected dog necessarily has genes for whatever disease it has and will pass them to its offspring. DNA tests allow breeders to make use of healthy carriers with no risk of producing affected pups. Dominant – even a single copy of the mutation will lead to disease, there are NO carriers with this type of inheritance. Recessive – a dog must have two copies of the mutation to develop disease, those with only one are carriers and will remain healthy. The presence of a mutation, in and of itself, is not a reason to eliminate a dog from breeding: Every dog has mutations. The only way to get rid of them all is to cease breeding dogs. If a mutation is common in a breed, excessive culling may narrow the breed’s gene pool. Heavy-handed culling can also lead to problems far worse than the one being culled. The Basenji offers an example of how this can happen. In the 1980s, armed with the carrier-revealing blood test, Basenji breeders launched a campaign to wipe out PKHA. They zealously screened their dogs, eliminating not only affected animals but the healthy carriers from the breeding population. PKHA became extremely rare in Basenjis – a breed with an already tight gene pool – but formerly uncommon late-onset Progressive Retinal Atrophy (PRA) and Fanconi’s Disease, a lethal kidney ailment, both became prevalent. Had breeders been less fanatic in their pursuit of PKHA, they might have avoided the increased frequency of those other diseases by keeping the healthy carriers in the breeding population by not breeding them to each other. At present, we can test for only a tiny fraction of the disease-related mutations that exist in the canine genome. To make constructive use of these tests we need to make the production of disease-free puppies the goal rather than the total eradication of the causative mutations. If a mutation is a simple dominant and the disease has serious associated quality-of-life or financial impacts, removing every dog with at least one copy of the mutation makes sense. In the case of recessive mutations, affected dogs – those with two copies of the mutation – should not be bred if there are serious quality-of-life or financial issues because all offspring will have at least one copy of the mutation. With less serious simple recessive diseases breeding of affected dogs should be avoided if at all possible. Exceptions might include a very high-frequency disease (CEA in Collies), a breed with a very low population or extremely tight gene pool, or a dog from very rare bloodlines. If a dog affected with a recessive disease is bred, it should be bred only to clear-tested mates. Carriers should be bred only to clear-tested mates with preference given to using clear offspring to carry on with. By doing this the mutation can be reduced to extremely low levels within a relatively short time while the carriers’ genes for desirable traits can be passed along. If carriers are eliminated, 20 thousand other genes are tossed out in true bathwater-plus-baby fashion, without for whether the dog’s variants of those 20K other genes are good, bad, or indifferent. If the tested gene confers a risk factor, as is the case with the Aussie HSF4 cataract mutation, the situation becomes anything but black and white. There are a variety of issues that need to be taken into consideration before firm breeding decisions are made. Risk factor genes really muddy the bathwater. From here on out, most of the disease genes to be identified are going to be for risk factors. We in dogs need to develop a constructive approach to controlling those diseases. A risk factor gene increases the probability that the individual will develop disease, but not every dog that has the disease-causing mutation will become ill. Who does and who does not is determined by other genes, environmental factors, or both. At present, we rarely know what these other genes or factors are. An Aussie with the dominant mutation of the HSF4 gene may get cataracts with only one copy, but it also may not. Even dogs with two copies don’t always develop cataracts. The degree of risk varies in genes like this, but with this particular mutation it is very high: A dog with it is 17 times more likely to get cataracts than one that doesn’t have it. How much extra risk a particular mutation brings needs to be considered. A gene variant that conferred a 2x risk is less likely to lead to disease than something which is 17x. However, the breeder needs to consider the average risk of that disease in the breed as a whole. If a condition is very rare, even a 10x risk factor may not be significant. Such a test might not be worth the cost unless a near relative has been diagnosed with the disease. Where a disease is common, even a small increase in risk may prove significant. Cataracts are the most common eye disease in Aussies, with 3-4% becoming affected at some point in lives. With a disease like this, even doubling the risk would be a reason for concern. 17x puts the test in the “must do” category. The MDR1 mutation presents a problem to the dog and its owner only if the dog is given too much of certain drugs, something that would never occur in nature. Rather than being viewed as a reason to cull, this mutation should be treated as a fault. If the dog has many other faults, the combination of those may indicate it shouldn’t be bred. However, if it is otherwise a very good individual, even dogs with two copies of this particular mutation might be bred to clear-tested mates. Over time the frequency of the mutation would be reduced without, in the case of Aussies, eliminating over half of the breed. In some instances, as with Collie Eye Anomaly in Collies, the frequency of the mutation is so high that most dogs have two copies of the mutation and only a tiny percentage are clear. In such an instance, breeding double-mutant dogs to each other cannot be avoided. Even so, an effort to reduce its frequency should be made through careful use of quality dogs that have only one or no copies. It would take many generations, but eventually the frequency of the CEA mutation in that breed would be reduced. Breeders would need to beware turning clear or single mutation males into popular sires based simply on their CEA testing status. There is ample evidence of the harm done by popular sire breeding and doing so based on the status of a single gene is especially risky. The Aussie HSF4 mutation is also very common. About a quarter of the breed has at least one copy. Because the mutation can lead to cataracts sometime in life (age of onset varies greatly) some advocate not breeding any of these dogs. This author did so before large numbers of dogs had been screened. I have revised my opinion because a quarter of the breed has at least one copy. Immediately removing that many dogs could have dire consequences. Cataracts are undesirable and no breeder wants to produce them, but quality of life issues for this disease are minimal to moderate. The only significant expense that might be associated with the disease is for cataract surgery, which is optional. Until such time as the frequency of the mutation has been significantly reduced it will be necessary to breed quality dogs that have the mutation. They should be bred only to clear-tested mates and high preference should be given to retaining quality clear-tested offspring to carry on with. Dogs with the mutation should not be bred extensively. Three or fewer litters should provide sufficient clear replacements. DNA tests are with us to stay, and with good reason. It is up to us to use them wisely. If test results foul the bathwater, pull the plug and drain it away through careful and informed breeding practices so the “baby” – your dog’s good qualities – will be with you to stay.